It should be a nice, uneventful week for Premier League referees, though at this stage in the season – and with the title race still somewhat open – I guess “uneventful” is a relative term. Mark Clattenburg and Howard Webb are both back in action on Saturday, with Clatts taking Norwich v. West Bromwich Albion and Howard at Hull City v. Swansea. 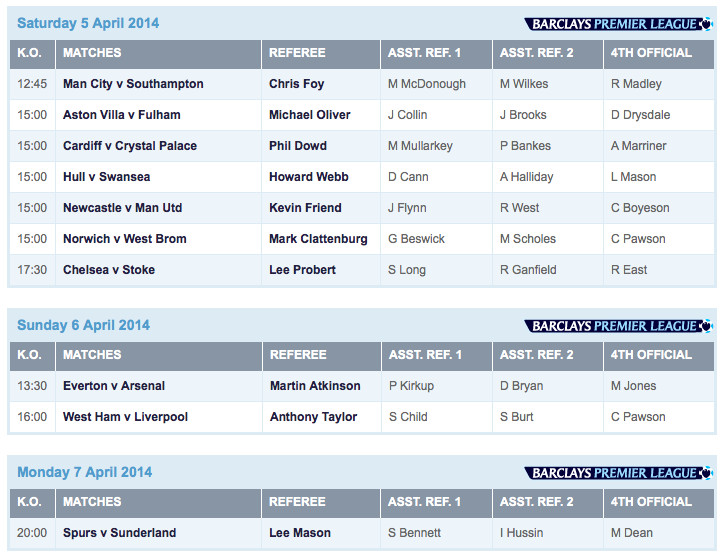 As for my ridiculous Spurs, we have Sunderland and our referee is Lee Mason. Um. Yay? Look, I have nothing but love for Lee Mason, but he hasn’t exactly been the most consistently shiny bulb on the refereeing Christmas tree this season, has he? He flickers…you know? Let’s hope he stays nice and shiny at White Hart Lane.